Whether you’re a fan of getting your fingers green or are absolutely LOVING this succulent trend, we have the perfect tutorial for you! As the days get sunnier and everything begins to blossom, it’s a fantastic opportunity to bring your plants to life with an upcycled plant pot. Read on to find Maxine’s crafty tutorial and tips on how to make these striking looks. 1. Paint your chosen plant pot with DecoArt Black paint, allow to dry. 2. Plan your heart shape before adhering each button to the pot. 3. Write the word ‘grow’ with a pencil in the centre of the heart, before painting over it with the DecoArt Delicate Chalk paint. How sweet is this design? This plant pot would make a wonderful, personal gift for a loved one! Simply change up the word to fit the occasion! You could also use the First Edition Deco Mache papers to upcycle a plant pot! With so many decoupage paper designs on offer, you won’t be stuck for choice and we love the glossy effect it has! You could go really jazzy with your design by painting your plant pot with your chosen DecoArt colour, painting a layer of Dovecraft clear glitter glue on top and adhering a selection of clear Simply Creative gems! You could either pick the first letter of a friends name or create a cool pattern, the decision is in your craft hands. 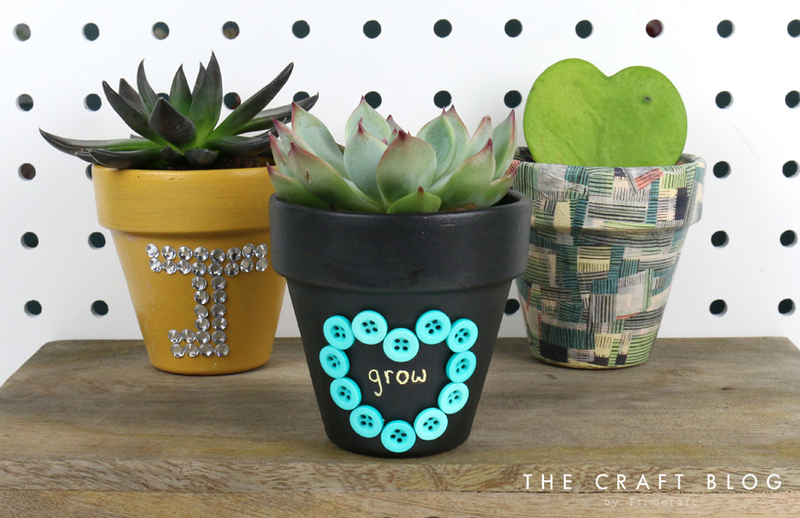 We would love to see your upcycled plant pots so make sure to upload your makes to the inspiration area and to #trimcraft when uploading to social media.